The ground crew helps put together and set up the balloon, chases while the pilot and passengers fly and help pack everything away once the day is done. 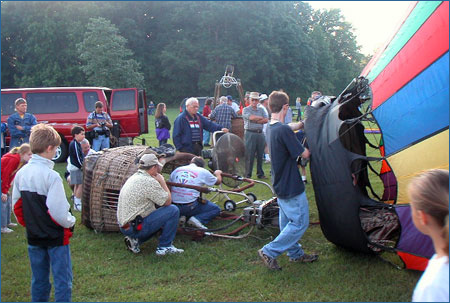 Crewing for a hot-air balloon is like playing a team sport, and many pilots and crew might agree that ballooning is a team sport. All balloons need crew, and no pilot, could get by without their crew. 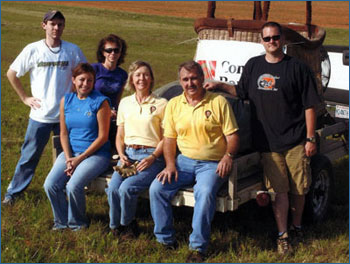 They are the unsung hero's of the ballooning world, but they have their own dirty little secret: crewing is fun! Crewing for a hot-air balloon may sound like a lot of work but if you enjoy the company of good friends, the thrill of the chase, using a map to find your way, and just being involved there is nothing like crewing for a hot-air balloon. Many pilots started as crew, and one thing that they all agree on is that once you start crewing you get hooked. That sounds like fun! How do I get involved? So you've decided that crewing sounds like fun, now how can you become a 'crew member'? It's very simple: find a local pilot and volunteer your services as crew. Most pilots are constantly looking for new crew members. If you don't know any local pilots, or how to get in contact with them, that's were we can help. Please feel free to contact us here at the Heart of Dixie Balloon Club, we'll get you in touch with someone. If your still not sure, many cities and towns around the country have small balloon races each year, and at nearly all of those they are always looking for willing crew members! The pilot will instruct you on how they do things. The pilot is in charge and the final word on any and all questions. Have fun, don't be afraid to ask questions. No smoking near the balloon, EVER. Balloons use propane for fuel...it's highly flammable. No drinking, save that till after the flight is over. Be mindful of ropes or cables, don't straddle them or tie them to your body. Wear gloves, rope burns can do a number on the hands. Dress in layers, you can shed them as it gets warmer or apply as it gets cooler. Wear long pants, balloons sometimes land in thick grass. If you have bad allergies, bring your medication along.